In fact, seminal “Black” TV programs (aka shows with a Black lead regardless of whether or not the subject matter skews toward the Black experience or not) often take a comedic bent, touching on issues affecting our community from time to time but always in a tone meant not to alienate non-POC viewers. For example, many of the classic Black comedies of the ’90s and early aughts came complete with a laugh track; The Fresh Prince of Bel-Air, Martin, My Wife and Kids, and Girlfriends just to name a few. Though a laugh track is obviously a harbinger of when to laugh, the shows, especially the Fresh Prince, were most powerful in scenes where the audience noticeably fell silent. Even today, though shows like Black-ish (and most recently Everybody Hates Chris) have ditched the laugh track, they still operate with a sense of “are you seeing this?” bewilderment, occasionally breaking the fourth wall so its protagonists can appeal directly to the audience. Black-ish, currently the only other mainstream Black comedy on air (at least until Issa Rae’s Insecure premieres next month), is a show that tasks itself with portraying the Black experience in all its nuanced and micro-aggression-filled glory. 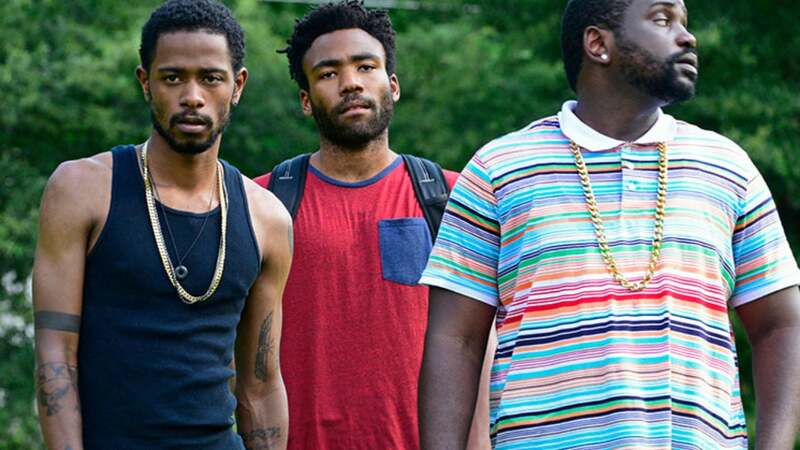 But Atlanta, currently three episodes in, is different from what we’re used to – not just tonally but also stylistically. It’s the equivalent of a well-argued Twitter rant when we’re used to TSwift-esque subs and retractions. Basically, it’s about damn time. Glover’s straight performance lends itself perfectly to the absurdity of the scenes he depicts. In the show’s second episode, Glover’s character Earn languishes in central booking while a clearly mentally ill man in a hospital gown parades around manically. It’s revealed that the character frequents the jail “every week” with one man remarking “he was in here the last time I got locked up. That n*gga crazy.” The man (referred to genially as Lee) fills a paper cup with toilet water and proceeds to drink it. “Why is he in here every week? He look like he need help,” Earn comments. “Man, shut up,” a guard says, looking on with amusement. It all seems very harmless until Lee spits water at an officer and is promptly struck in the face with a baton and pinned down by three officers while Earn looks away with a pained expression. The camera lingers on Earn’s clearly disturbed face as the alarm system goes off. This scene very deftly and accurately depicts how mental illness is handled in the Black community, as a criminal justice issue rather than a mental health issue. With a rate of mental illness inside jails currently four to six times higher than on the outside, and with 37 percent of the 2.2 million inmates in 2014 being African-American men, this is an issue that disproportionately affects our community and that is touched on far too rarely. Other issues Glover chooses to tackle (within the first three episodes, no less) are gun violence, mass incarceration and the phenomenon of being a bystander to a white person using the n-word. While other Black shows can and have touched on these issues quite capably, there’s something about the straightforward lingering of the camera and the passive acceptance in Earn’s eyes that drives the point home in ways more nuanced than other highly stylized comedies are capable of. Stylistically, the cinematography of the show is deliberate. The pacing is leisurely—a fitting choice given the laid-back pace of the show’s titular locale—and perhaps the indulgence of letting scenes play out as long as they need to is what makes the impact so great. Glover tapped Hiro Murai, his longtime music-video director, to direct Atlanta despite Murai’s relative newness to the medium. Atlanta airs Tuesdays at 10 p.m. on FX.